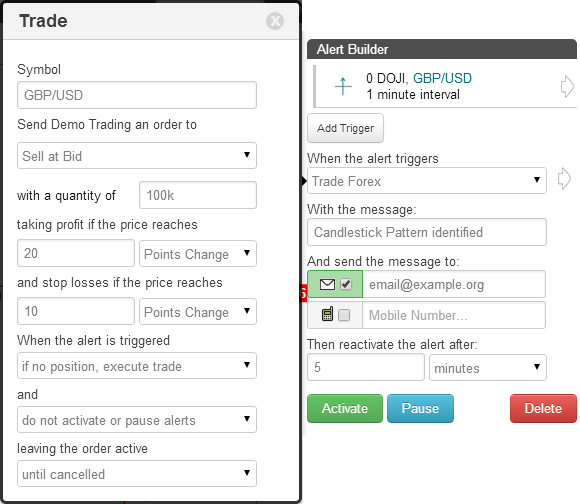 On the TimeToTrade charts, a True Strength Index indicator can then be used to execute trades, provide an Email or SMS text message notification when your candlestick chart patterns have been met or backtest a trading strategy. The True Strength Index (TSI) is a momentum-based indicator that is used to help determine trend and identify overbought and oversold conditions. The indicator has very limited time lag compared to for example a moving average, and so is particularly useful for spotting early changes of trend. The TSI will rise when the short term trend is up and fall when the shot term trend is down. An increasing TSI indicates increasing momentum in the direction of the price movement. When the indicator is rising above zero, the price is always rising. When the indicator is falling below zero, the price is always falling. Technical analysts have their own preferences as to what are considered overbought and oversold levels. Typically values of -25 and +25 are used to indicate levels whether the market is overbought or oversold, but +/-30 and +/-50 are also common. Learn more about the True Strength Index indicator. Rising Threshold Alert Trigger, is triggered when the value of the True Strength Index rises above a specified value. Falling Threshold Alert Trigger, is triggered when the value of the True Strength Index falls below a specified value. Break-Out Alert Trigger, is triggered when the True Strength Index increases by a specified value within a the selected interval period. Pull-Back Alert Trigger, is triggered when the True Strength Index decreases by a specified value within a the selected interval period. Percentage Break-out Alert Trigger, is triggered when the True Strength Index increases by a specified value within a the selected interval period. 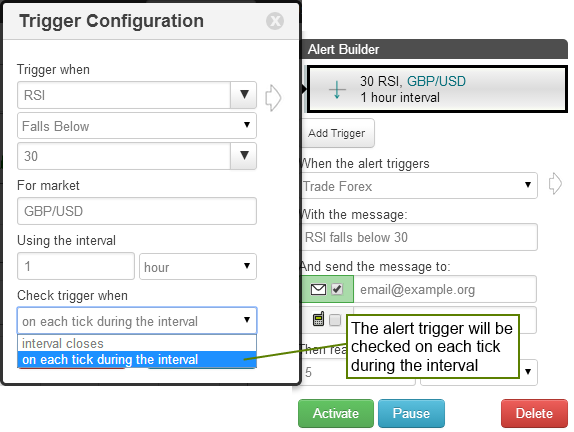 Percentage Pull-back Alert Trigger, is triggered when the True Strength Index decreases by a specified percentage within a the selected interval period. 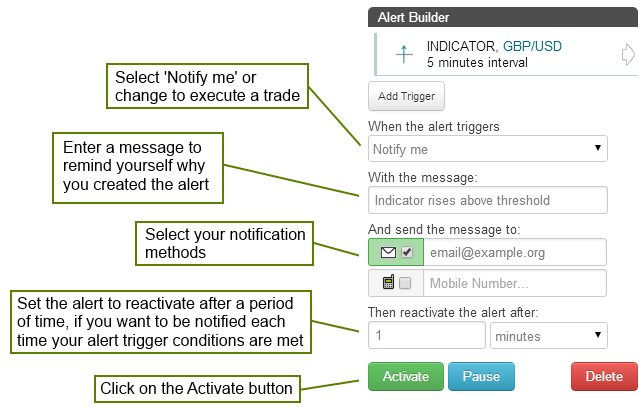 Above Alert Trigger, is triggered when the True Strength Index is above a specified value. 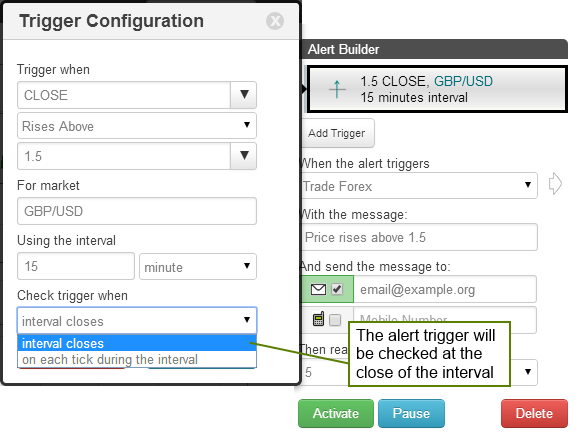 Below Alert Trigger, is triggered when the True Strength Index is below a specified value. Positive Crossover Alert Trigger, is triggered when the True Strength Index rises above / crosses over another indicator, price, a specified value or trend line that you have drawn on the chart. Negative Crossover Alert Trigger, is triggered when the True Strength Index falls below / crosses under another indicator, price, a specified value or trend line that you have drawn on the chart.